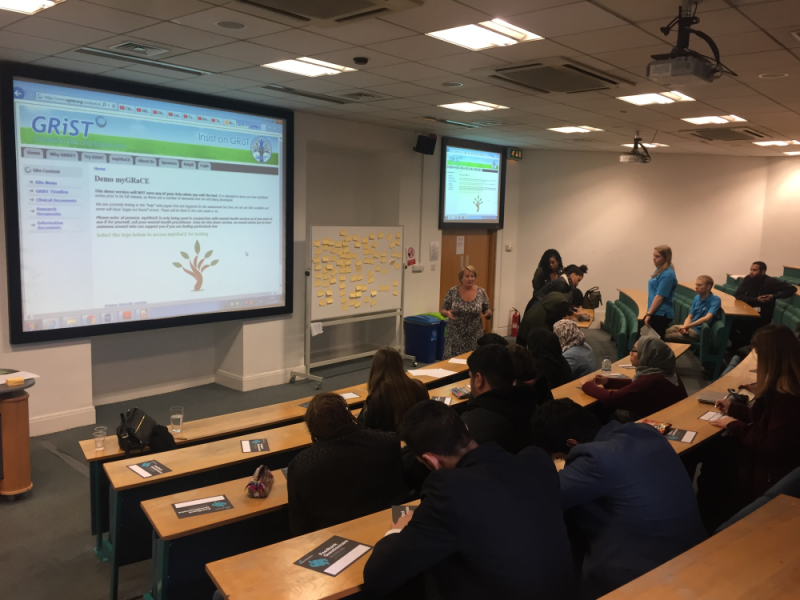 Two “MasterClasses” in December were conducted with over 60 sixth-form students from schools ranging from locations in Suffolk to Shropshire, as well as more local ones. The focus was on mental health in the community, with a workshop where the students tried out the GRaCE-AGE technology. Ine D'Haeseleer successfully passed her first year review examination today. She is working full time on the GRaCE-AGE project and has done an excellent review of the software interfaces with comprehensive recommendations for upgrading them. This has now been done and we are ready for the second phase, which will include gamification linked to automated sensor date. The aim is to make GRaCE-AGE fun for all users as well as an invaluable resource for managing care in the community for older adults. 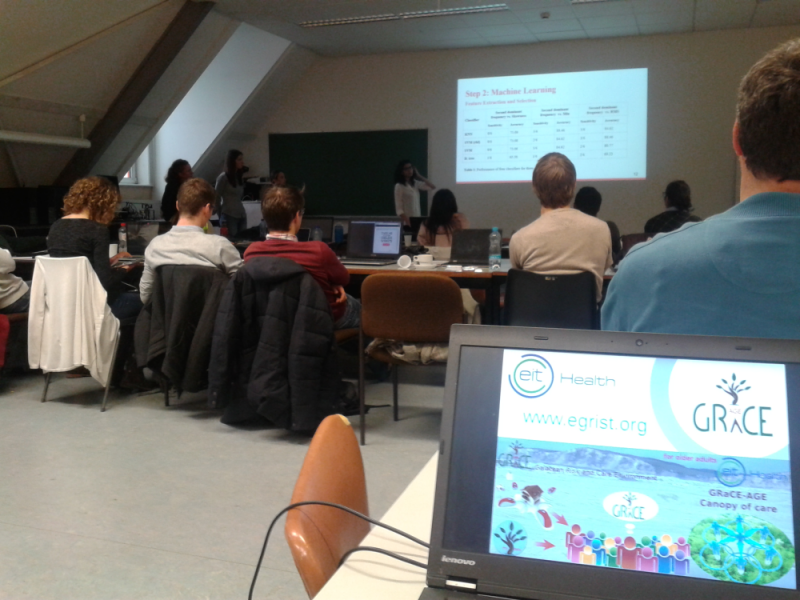 The GRaCE-AGE team created an ATHENS module called Health Informatics in the Community, which was delivered at KU Leuven in Belgium from the 14th to the 18th of November. Fourteen students from different Universities across Europe attended and the feedback was extremely positive. Dr Buckingham described the GRaCE-AGE project, which might appear to be more towards the "grave" end but is also relevant across the age range: carers of older adults can be students still at school, for example. The EIT Health officers asked all ongoing projects to come to Munich for review hearings and GRaCE-AGE's appointment with its destiny was on September 30th at the Municon Centre, Munich Airport. The project was represented by Christopher Buckingham from Aston University, Ine D'Haeseleer from KU Leuven, and Joris Wille from Bewell Innovations. We are happy to report that our project was well received and our proposal for 2017 is now part of the EIT Health business plan. Christopher Buckingham is the coordinator of GRaCE-AGE and was an invited delegate to the EIT Health Summit in Barcelona where GRaCE-AGE was a featured project in the conference video presented to over 300 attendees (https://vimeo.com/192954786 at 2mins 40s). This summit is a celebration of all EIT Health activities and an excellent venue for creating new collaborations across Europe. The summit was held at the Cosmo Caixa science museum with a reception at the CaixaForum art museum. Our GRaCE-AGE partner university, KU Leuven, hosted the 2016 Engineering4Society conference, Raising awareness for the societal role of engineering. Ine D'Hauseleer a PhD student fully funded by the GRaCE-AGE project and the first author of a paper that evaluated the first version of myGRaCE produced during the project. Her paper is called Attitudes of Older Adults towards Self-Assessment of Mental Health, Safety and Wellbeing. The paper and more information can be found in the GRaCE-AGE website. GRiST is presenting to the MEIbioeng 16 at Keble College, Oxford. Read more about GRiST is presenting to the MEIbioeng 16 at Keble College, Oxford. We are presenting at the MEIbioeng '16 conference, which is taking place on the 5th and 6th September 2016 at Keble College, Oxford. It is in the mental-health track on Monday, September 5th, which is hosted by NewMind. GRiST was an invited presentation at the National Information Board working group. It was in the "horizon scanning" section where the Board looks for new technologies that could have a big change on the way the NHS works with information technology in different areas. GRiST is different because it explicitly models mental-health expertise in such a way that predictions can be made from the patient data. AMIA 2016 Annual Symposium is the 40th anniversary of the Symposium. It has "the best of all worlds when it comes to soliciting and presenting the very best in informatics science and practice. In the rapidly moving world of health and healthcare, informatics innovation is integral to progress.